A comprehensive strategy that ensures that economic objectives deliver on social, equality and environmental targets. Invest in affordable housing, energy-saving priorities and social/health infrastructure to ensure positive results on multiple Europe 2020 goals: creating new jobs, investing in people, preventing poverty and tackling climate change. Ensure tax policy contributes to long-term social and environmental objectives. Embed ex-ante impact assessments to guard against unfair distribution, promoting a tax justice model. Develop sub-targets and thematic strategies for key priorities/groups: tackling homelessness, investing in children, Roma inclusion and across themes. Ensure affordable access to quality services – particularly Housing, addressing homelessness, health and long-term care. Require measures to increase affordable access to housing: social housing, rent-regulation, tax reform, as well as diversification and re-balancing of housing tenures. Give priority to investment in integrated social protection across the life cycle, guaranteeing adequate minimum income, unemployment benefits and pensions with EU-wide benchmarks. Investing in children and youth, combined with integrated strategies for all, at-risk groups. Encourage implementation of integrated strategies to invest in children (and their families), in line with the Commission’s Recommendation. Ensure that an integrated approach to social inclusion and poverty reduction across the life-cycle is promoted for all key target groups. Create sustainable, quality employment across the life cycle. Concrete measures to reduce in-work poverty and gender pay gap: increasing minimum wages, supporting living wages and work-life balance, defending employment protection and social rights. Explicit promotion of integrated Active Inclusion (income support, inclusive labour market and access to quality services), based on personalized integrated support. Access to affordable childcare/ECEC to support women into work. Support to active ageing to enable older people to move/stay in jobs with age-friendly LM. Universal access to quality, comprehensive education and measures to tackle segregation to key groups. Develop lifelong learning and support , on-the job training and lifecycle management for older people. Promote an integrated approach to ESL: prevention, intervention and compensation measures and individualized alternative ‘2nd chance’ partnerships. Vocational Training responding to the labour market and individual needs. Ensure that broader educational values are enhanced beyond labour market needs. Reduce the gender pay gap, with a national strategy to eliminate wage discrimination and gender segregation in education and work. Specific Measures to counter multiple discrimination against Migrant Women – reinforcing employment and social protection rights/independent status. Ensure climate change objectives have clear guiding principles, measure targets/indicators, timelines and monitoring mechanisms. Carry out ex-ante social/gender impact assessment to ensure burden does not fall on the poor, excluded and women. 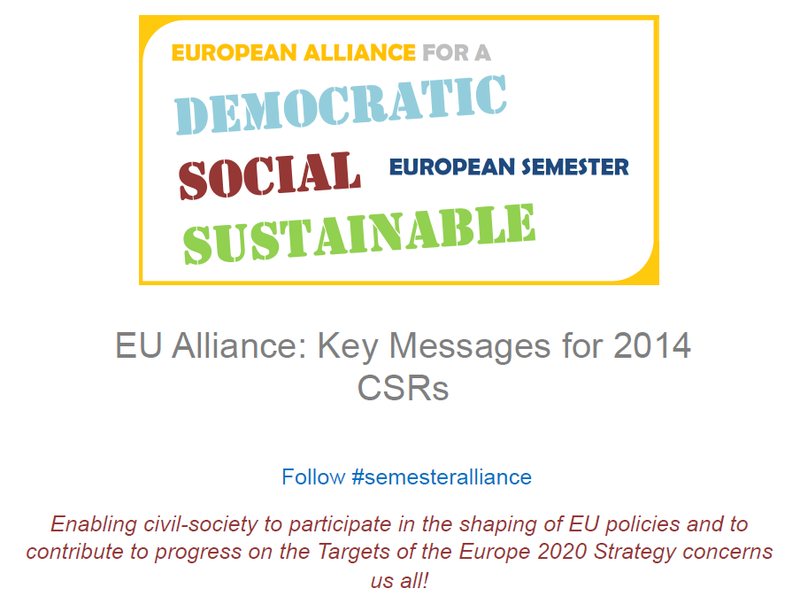 Click here to open the Semester Alliance key messages on Country-Specific Recommendations as a pdf.